A few weeks ago, I showed some fabrics I got in the fall. I had them sitting around for several months, but could never decide what to do with them. 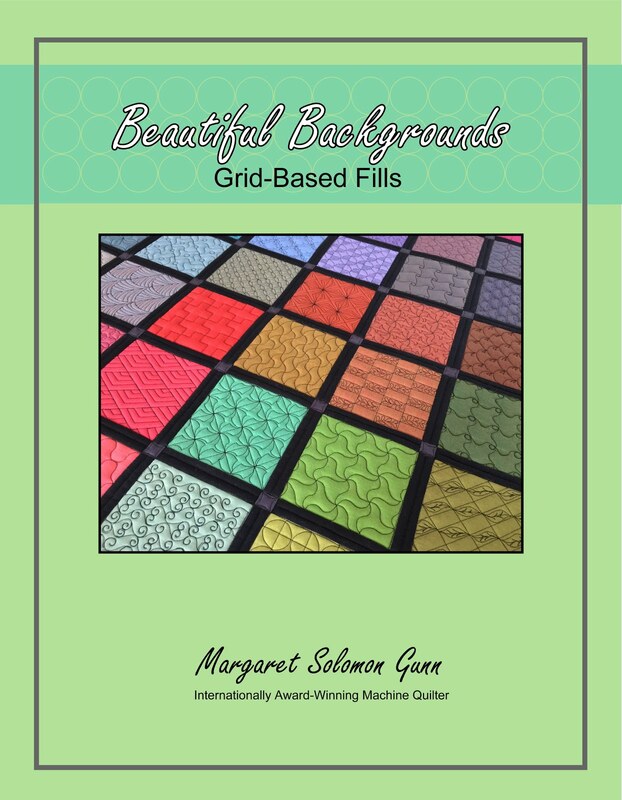 The gradations are gorgeous, but I couldn't come up with a design that showed off their gradations. I've quit sitting on them. I have an applique project started. It will have several panels of whimsical applique. The first of these is done, and the second is more than half finished. It keeps my fingers busy in the evenings, and keeps me from going to sleep in my chair! The curly tendrils are not symmetrical; I know that. I'm waiting to see if it's really going to bother me enough to remove one and adjust it! The center medallion of the quilt will be this fun bird. 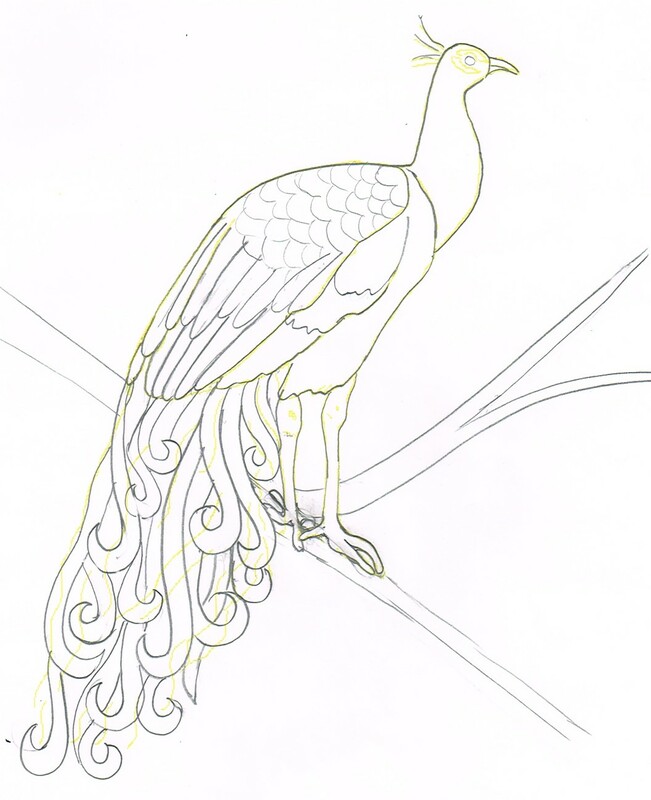 I'm still sketching, and trying to jazz up the peacock. I can see these swirly feathers in the shades of aqua and teal, and I know that I can make him come to life with the quilting. 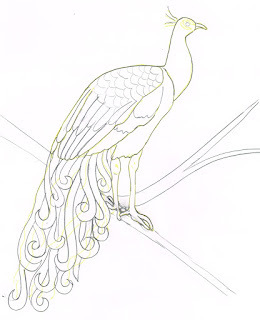 Who'da thought that peacock toes would be the hardest part of drawing a bird?! I have a couple of custom quilts in the works for clients and another couple on next week's agenda. The mad flurry to get quilts done before my kids are out of school has started. I'm already stressing over how on earth I will get things quilted for the 8 weeks they are home! 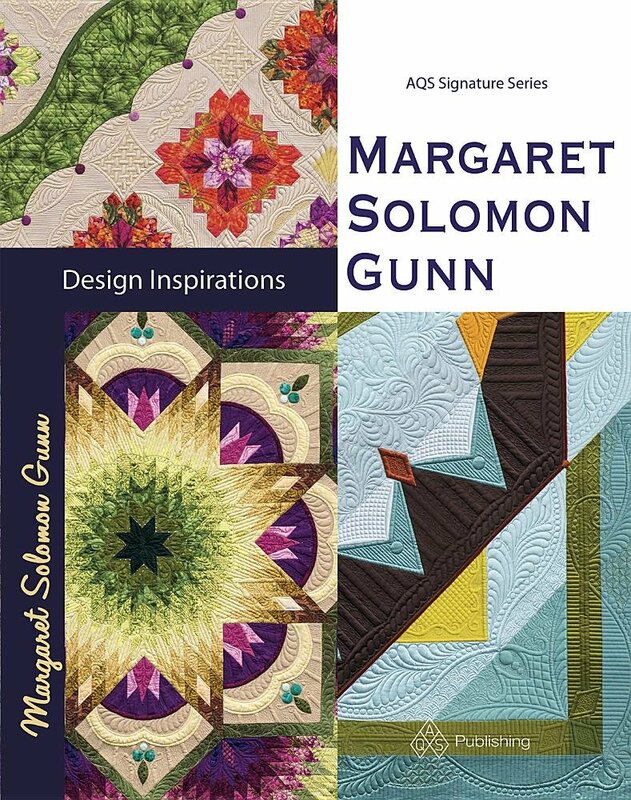 Cross your fingers that my quilts going to MQS and HMQS this month do well (Mama needs some summer-camp cash!). Here goes...my last MQX post. Believe me, I have more that I could share, but there comes a time to know when to keep one's mouth shut and just move onto something different. One of the special exhibits this year at MQX was called Neutral Fusion. Perhaps you remember a couple months ago when I posted some pictures of a small quilt I was working on. Or not. Anyways, there were about 10-12 people that participated in this exhibit. We were given 8 fat quarters of neutral prints. I kind of thought they were fugly. I am not a fan whatsoever of white-on-whites, and some of the beiges were not so great either. The quilts are all 30"x36" and constructed of alternating 9-patches and snowball blocks. The inner border was of our choice, as was the design of the outer border, but it had to be a neutral shade. 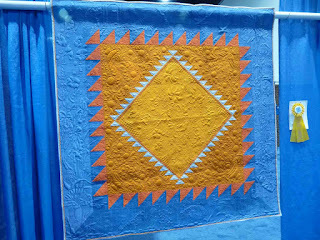 The intent of the exhibit is to show how differently the quilting can affect the same neutral quilt. 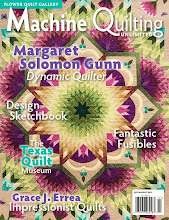 Gotta love this - it reads MQX Quilts 2012. There's creativity at work. There were 2 that had Christmas themes. Look closely in the border and you'll see a Santa I think. It's back to client quilts for me. I am out of MQX posts, unless you want to hear about my awesome classes. I may hold onto that post for when I have nothing whatsoever interesting to say. 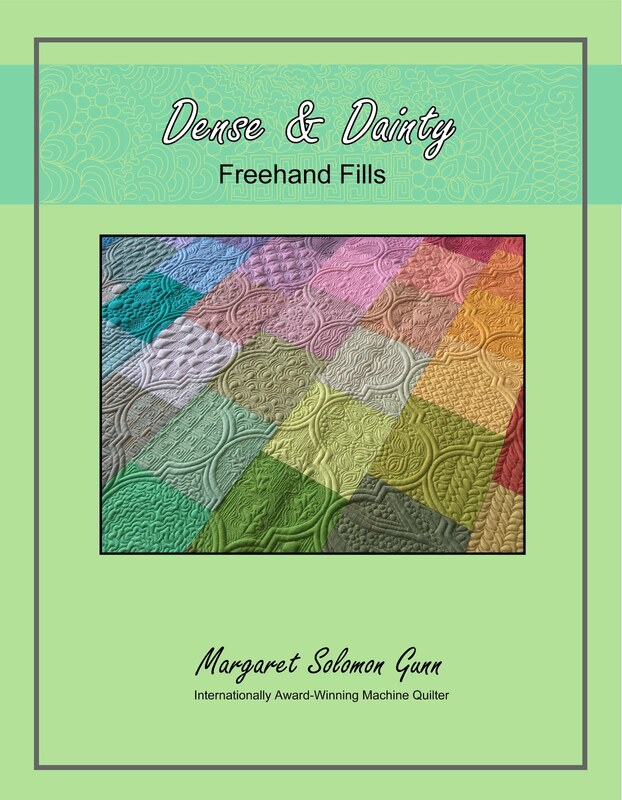 I will be getting back to quilting my client's quilts starting tomorrow. Or maybe I will take one day to clean my studio first, as it is about to implode from threads. I took my quilt off the frame, thinking it was mostly finished. Of course, I have noticed one 1" line of stitching not done. It always works that way. Maybe I will just try to fix it on the domestic. Anywho...here are a few pictures of the back of the quilt I just nearly finished. The pictures don't do it justice. The backing is a soft butter-yellow, and shows off the quilting really well. This is the center. I was not really satisfied with what I did on the center star. I quilted something densely, then picked it out, then hated what it did to the fabric (lotsa little prick holes). I suspect they'll go away when it gets wet, but I just couldn't come up with something to stitch that I liked. 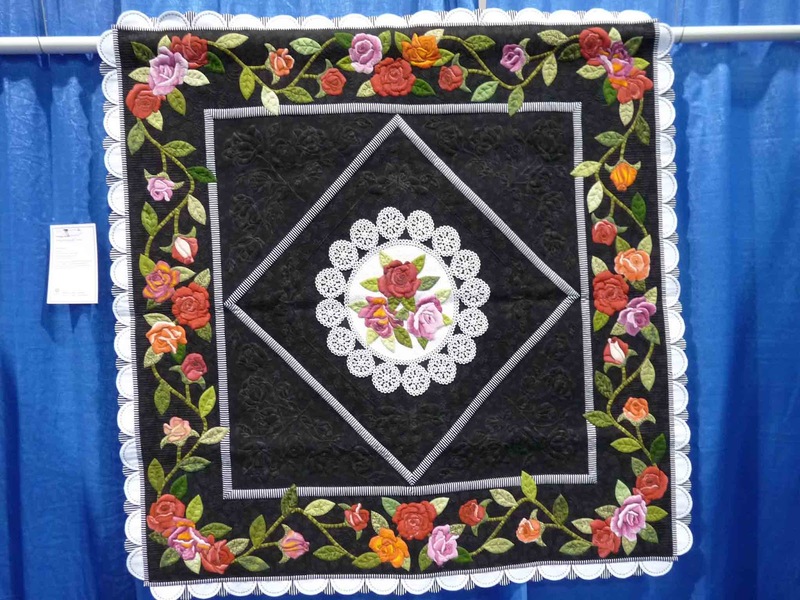 The wildness of the outer border is very evident with the quilting finished. It was a complete pain in the backside because of all the stop and starts. I guess I knew that going into it, so I shouldn't be whining. I have a few things to do still...fix the missing stitches, block the beast, bind it, do a little hand painting in gold, and add a couple thousand crystals. It's all doable before mid-July. I think. This is closer than I generally cut it in terms of time, because I am notoriously slow, especially when those kiddies are out of school in (as my daughter tells me daily) about 35 days. If you want to see the finished pictures of this quilt, you'll have to come back in late July or visit the Maine Quilt Show. 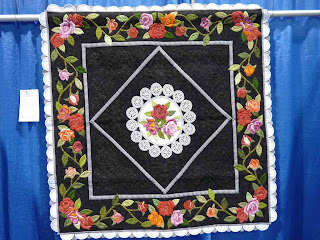 I am hoping to also enter this at the Lowell Quilt Festival. I had to get it off the longarm in order to take a picture to send them though! The first few are quilts from the small quilts division. This hummingbird is by Jan Hutchison, who is a fantastic longarmer. She had several quilts in the show. 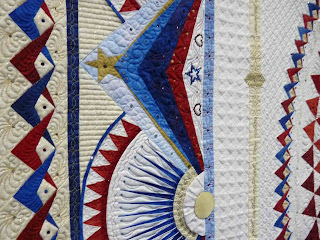 Lisa Calle, another great longarmer, did this small quilt. She earned another ribbon on her other quilt too! 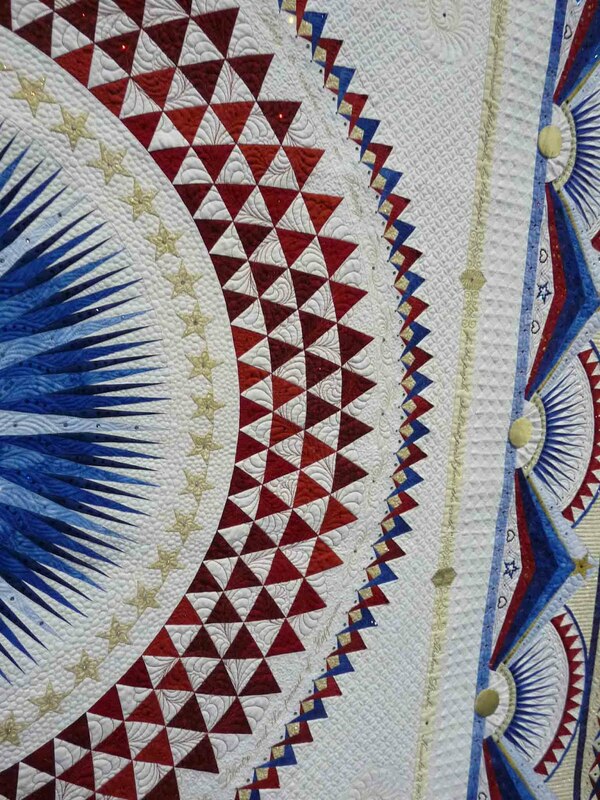 The small-scale quilting is spectacular. I believe this is by Lois Polodny. 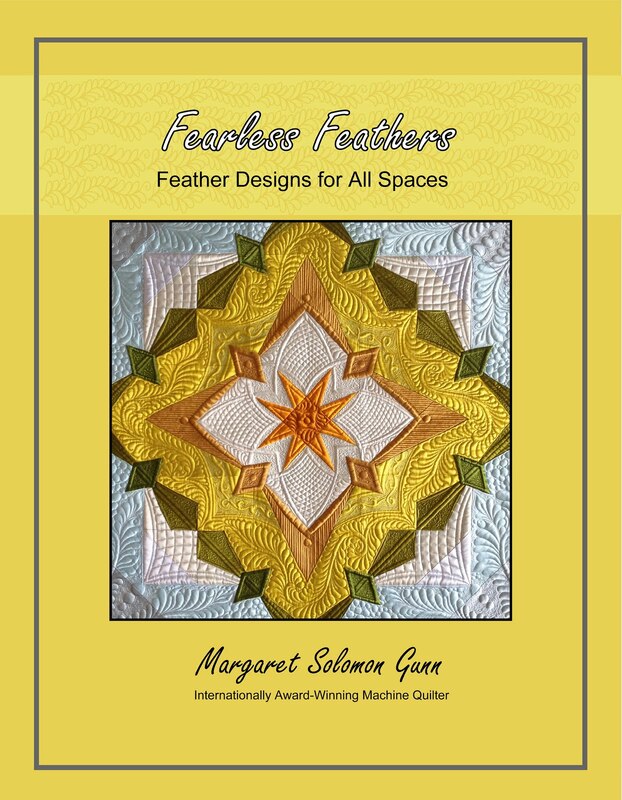 If you look at the detail, there is so much within the quilting with pebbles, and feathers and textures. Just lovely. 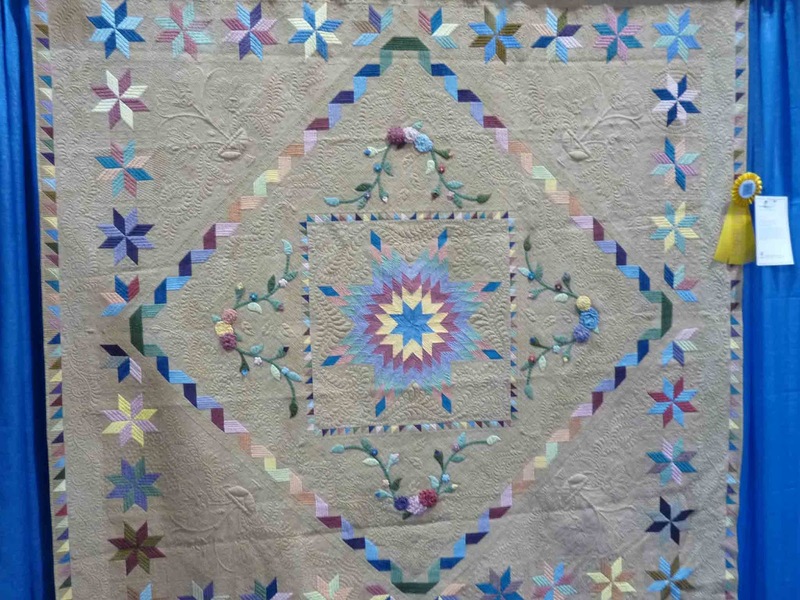 Kristin Vierra's group quilt. This was at MQS last year (beat my quilt that took 2nd!). The applique and gradations are pretty. I'm not sure how exactly a group did this! This is Turtle Bay by Claudia Pfeil. It's all silk, and is embellished with a trillion crystals, as all her quilts are. I took 2 of Claudia's classes this trip. She's a total hoot - completely loved them. Guess I should show some detail pictures, but she has a link on her facebook page to see 99 pictures of how she created this quilt. 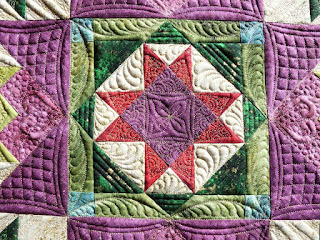 This next one is another group quilt, quilted by Bethanne Nemish. I met her last week in person, after seeing her work on MQResource. She's another really nice quilter. I think the next one is another of Jan Hutchison's quilts. 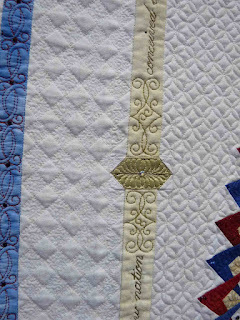 Her quilting is phenominal - don't know why she didn't ribbon with this old-fashioned design and great quilting. As I alluded to, there were also some "different" quilts that make you stand back and scratch your head. It's more artsy than I appreciate easily, but whatever floats your boat! It too has about a zillion crystals - enough to half blind you. 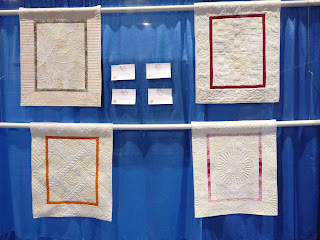 Cindy Seitz-Krug's lovely bed-sized quilt is all Cherrywood hand-dyes. I know this has done the show circuit last year and brought home several awards. The quilting may not show much, but it's tiny and pretty. Not sure the maker or the name of this quilt. I was intrigued by the infusion of the black & white with the pretty flowers. It works, in an interesting way. Sorry, this is another unknown maker. The applique is interesting, busy and detailed. 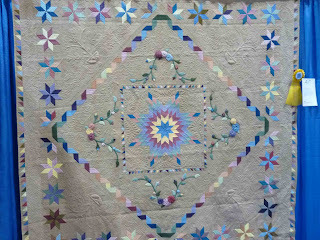 Very pretty quilting too. I think I am getting down to maybe one more MQX post if I find time this weekend. But you get the idea...the quilts are really good. It's intimidating how good they are, even to me! 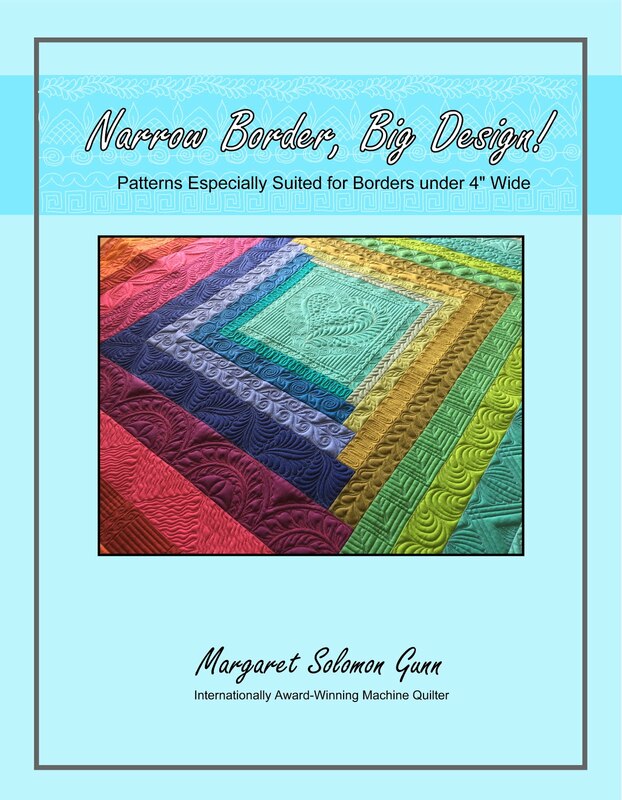 Just makes you wonder how much higher the bar can be set for machine quilting! Here is the Best of Show, by Sherry Reynolds. It's called America, Let it Shine. It's kind of no surprise whatsoever that this quilt won. It's amazing, and she quilted it on a domestic machine. Hard to believe. She's combined regular cottons, fabrics that appear to be batiks/hand-dyes and some gold satin even. 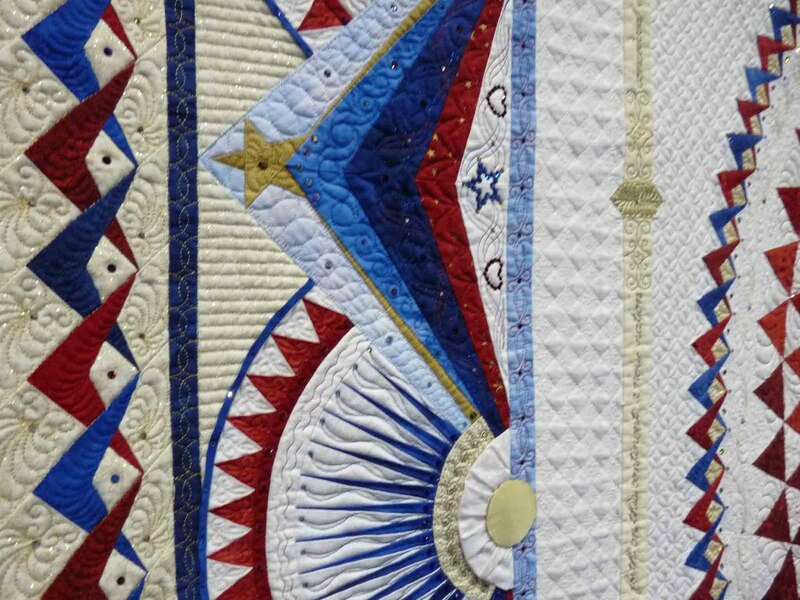 There are the words to the constitution written in near-perfect script around the quilt, and if I go back and read the card by the quilt, will learn that there's symbolisms in the number of stars, etc that are on the quilt. The quilting is detailed, and would have had an absolute ton of stops and starts to look the way it looks. The outer border below, for example...I would have taken the lazy approach and stitched in to the cream triangles from the outer edge so it could be stitched continuously. She started and stopped each one beneath where the crystal is afixed. This, sadly, was the only ribbon-winner that was not hung so that we could oogle over the backside. I'm sure it was fantastic. 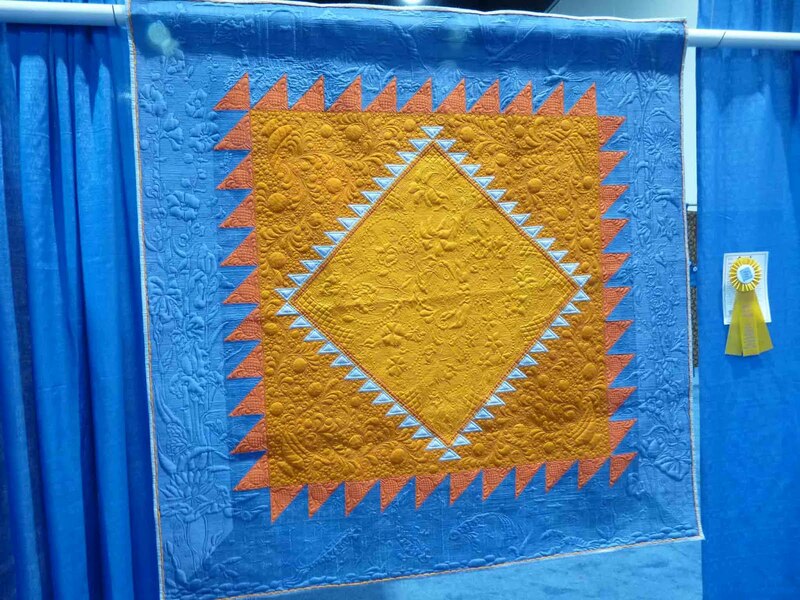 The quilt has won at every show it's entered, so be on the lookout if you go to a major show this year. It's well worth a good look. 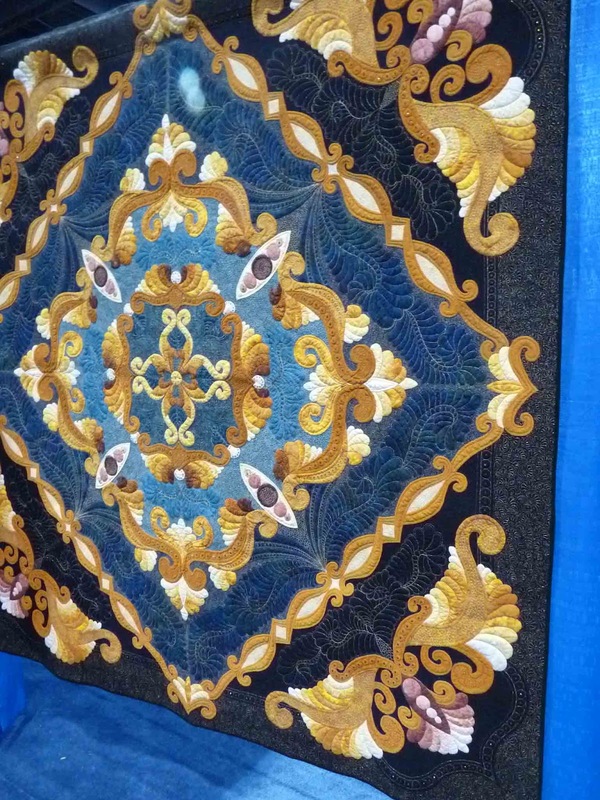 The quilts in this post are the ribbon-winners in the Solo category. I realized I have not really shown very many of my Meet Me at Giverny quilt as I was quilting it, so here's a few. As I posted a couple days ago, the quilt won a surprise 2nd place. Go to the link to see a full shot of the entire quilt. 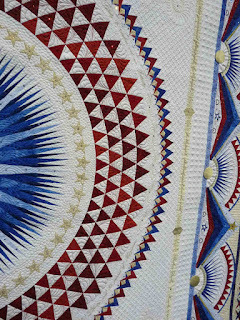 Also, note that some of the close-up pictures I am posting were taken before all of the quilt was completely finished. There's at least one taken before the painting was added, and another that I noticed a section of quilting undone. The outer borders are quilted with freely-placed sunflowers. I used gold Glide thread almost exclusively, and it looks fantastic with the gold flecking in the Stonehenge fabrics, which as I said, reminded me of Monet's gardens. I never expected that this quilt would place as well. Usually you need some applique to show diversity and added ability. I was very pleasantly surprised. My jaw nearly hit the floor when I learned it took a 2nd. I do have a rope template, but it's a pain to use so for this one, I made a template from cardboard, and marked the rope. It is freehand, and I know there are subtle bobbles. I have learned to live with them. That is part of this process. I love how the dense quilting allows the squares on point to pop, and how the very-simple style of the feathers in the green border just settles the eye. So much about the quilt is busy. It needs rest occasionally. 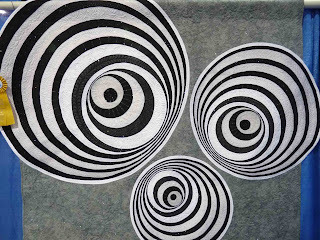 I designed the quilt to show optical illusions with the borders. It was a little tricky piecing, but viola...it did work. I am getting better with creating frames with my quilting rather than just plunking quilting into the sections of piecing. That's boring. The frames give much variety and depth to the piecing. I ordered one of Ronda K. Beyer's large double-S hatching rulers, but I have yet to use it for cross-hatching. The s-shape makes wonderfully pretty framing lines. As it has been pointed out, I have my (getting to be my trademark) rays at the center. There's just something about filled rays to bring the eye inward to the focal center of a quilt. OK, there ya go. That's my entry, and judging by the number of people I spoke with at the show that liked the quilt, I think I underestimated how it would do. 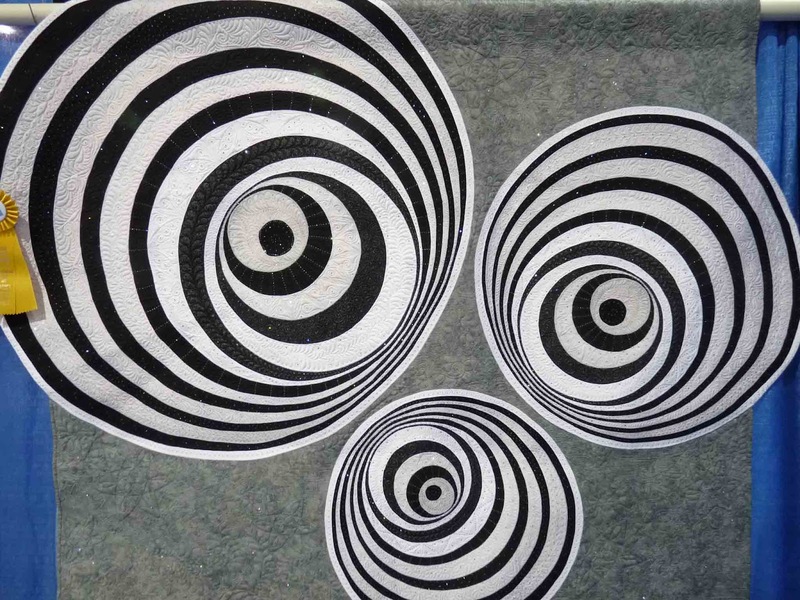 This is Keith Dommer's quilt (Curvilinear Energy) that took 1st. It's a bit smaller than my quilt. It has a goodly amount of yellow machine applique on a rather busy background. Unfortunately, I found it hard to look at the quilting because it just didn't show much. The quilt appears to have been washed and dried, and is very puckery. Good thing I'm not a judge. They are trained to see things I don't see obviously! I have a closer picture of the center. The silk has a gorgeous sheen. I loved it so much that the night of my win, I went and splurged on 2-1/2 yards of dupioni silk to make a small quilt maybe for next year! Next post?...maybe more quilts (I have a ton of pics), maybe the Neutral Fusion exhibit, or maybe progress on my own quilt. Stay tuned. These are some of the results from the Large Traditional Wallhanging division. You saw from the previous post that my Zen Garden quilt received the Honorable Mention. Here are (albeit, mediocre quality) pictures of the three that came in ahead of mine. Much variety in this "traditional" category, dontcha say?? This is Janet Stone's Letter Carriers, and it got 1st. If she ever stops making quilts with letters, we'll probably walk right past it without giving it a 2nd thought. I probably should have counted all the little buttons and "attachables", as it is quite a few (most with letters on them!). 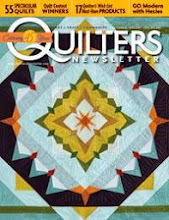 Second place was by Kathy Wylie, and was on a Quilters Newsletter magazine last month. It's stunning. I can appreciate fully how long all of this hand applique and vinework took. Third...Hmmm (I cannot locate who did this,or it's name, but I will update this with the appropriate info later). Three words: simple, classic, elegant. The silk fabric and trapunto mix is gutsy, and glorious. Someday. I returned last night from a busy 4 days at MQX. Although I have over 150 pictures to sort through before I post any, I thought I'd put up a couple shots of my own 2 quilts. Much to my surprise (because the confirmation email to ribbon winners came just after I departed for Providence on Tuesday! 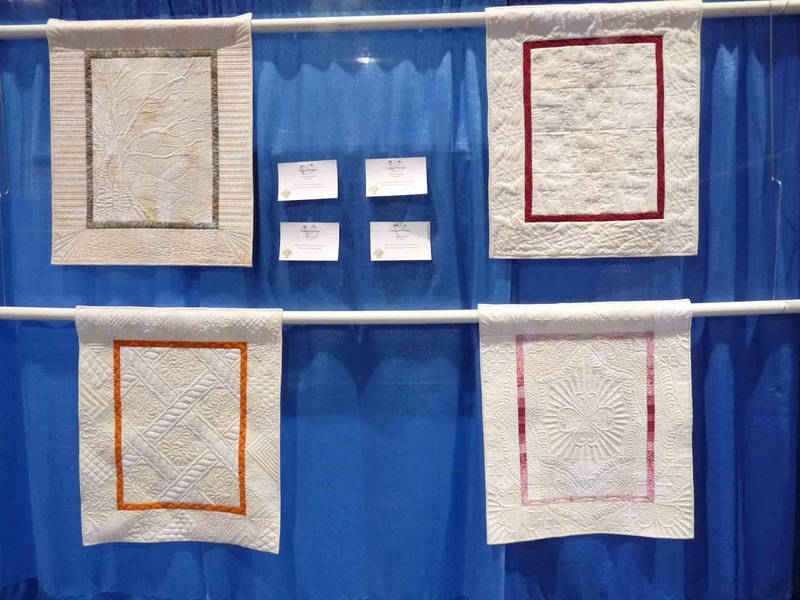 ), both quilts earned ribbons in very tough and large categories. I could really get used to doing the winner's walk up to the stage - it's a happy trip! The first quilt is Zen Garden, 65" square. It took an Honorable Mention. I love to see it when my quilts hang so straight and pretty (this is before the ribbons were even hung, at the sneak preview). It's headed next to HMQS if you want to see it. My other quilt, Meet Me At Giverny, is 69" square, and has my favorite Stonehenge fabrics that just remind me of Monet. This was entered in the Solo category, and I really did not expect it to fair as well, in that it is only pieced. Solo usually has some "blow your mind" quilts. It walked away with a 2nd place and some nice shopping cash. It will be traveling to MQS next month. I now must reintegrate with my family. I'll post more about the classes and other quilts this week. This morning was full of pre-trip chores...go to the grocery and the bank, do 2 loads of wash, locate a suitcase, finish the dreaded taxes...entertain the 5 year old, etc. Nothing all that fun here, mind you, but they all had to get done before tomorrow. With my long awaited departure tomorrow for MQX in Providence, I have this one last day to finish off a little bit of the quilting on this quilt. The 52" center section is done, as is half of the 2" purple border. I stitched it this morning, but quickly ran out of stitchable border because the rogue-tension cranberry thread had not been ripped out yet. Sadly, after I prepared all my stuff to take to my MQX classes, I rip-rip-ripped for over an hour. At this juncture, it is nearly done, and I may stitch the remainder of the border first thing in the morning (then again, I may just stay in bed!). I have two borders (one is 2" and the other is the ~7" applique border) left to quilt. Both are designed, but will probably take quite a bit of time (on account of all the applique). I have client quilts awaiting me, so I need to get finished up after I return this week. I love how it is turning out. It's different, for sure. The backside of the quilt is textural, appearing to have all matching bobbin thread. I have used gold, white and beige bobbins, none of which really appear different in color from the backing fabric. I finally ventured out a little, and stitched the pebbles (below) in the gold thread. It is only different enough to set off that frame slightly. I've stopped keeping track of my hours on this quilt...MANY. I quilt about 3-4 hours a day. The 52" ivory central part of this quilt is now down to the micro-fillers to be called done. OK, there are 2 sections that have to be ripped out on account of Sunday/Monday's bad adventures with mistensioning, but I may do that when it is off the frame, where I can get comfortable. It's gonna take a few dozen hours! Yesterday, I started the curved-crosshatching of these 20" feathered stars. I was a little uncertain right off the bat if the hatching density seemed dense enough, considering the fact that I have quilted the rest of the quilt to within an inch of it's life. After I finished the center part of the stars today, I have decided that the very traditional stars are just fine. They stand out in part because they are less dense. I may checkerboard-fill the CChatching later with silk, but for now this is it. All 4 of the center feathered wreaths came out good, considering they are completely freehanded. The four corners of the quilt are also now finished. I will likely come back after the quilt is blocked and paint the swirly vine to make it more prominent. The texture is simply amazing from the back of the quilt. I can hardly wait to have it off the frame to see the back! The view from below...but the texture is lost. It's kind of like a stained glass window. And lastly, I ended to day going back to the back-filling. I don't think this will take forever, but I have not really been the best judge of time thus far. We'll see! So, my question to you is this: Are you going to MQX next week??? Never again. I mean it this time. I have been good on my last couple of quilts about choosing a mottled or sort of busy print for the backing, but I got stupid this time. Never again. This quilt has a tan batik backing, despite my knowing that I was planning to use some colored threads. 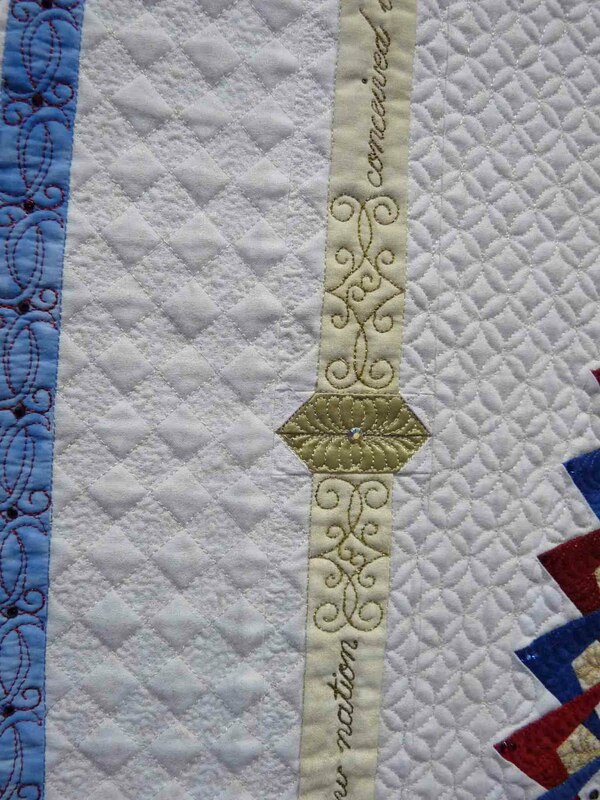 I always love seeing other people's quilts that have colored stitching showing. Why on earth did I think that I needed to be that crazy? You see, it all started so well. I spent nearly 10 hours ditch quilting this with monolon. The tension was near perfect. My stitching was as good as I could have asked for. Then I switched to a cream colored Glide, and began the larger motifs -- the feather sprays and the cross-hatching at the quilt's center. Seriously, in 12 hours of quilting, I only had one area that I knew I planned to rip out and "fix". It was going as well as could be expected, considering it is an 80" square quilt. Then things started to unravel. Last night, I decided to do some of the ivory dense background filler. There was no change of thread or bobbin, or anything that should make the tension go whacky. I stitched 4-5 sections of the ivory background, then had a look to find that the last one really needed an adjustment. It didn't look good on the back. Sadly, looking really good on the front left me just feeling frustrated. This is about the densest filler I have ever stitched. It will likely take 3 hours to remove that 6" triangle, it is THAT dense. I was upset last night, but trying to formulate a plan of attack for today. Clearly my plan of attack consisted of more foolishness and time-wasting efforts. Right off, at 6am I started on the squares on poing along that dark plum border. This is stitched with a cranberry thread. I rechecked the tension and went at it. As you can see, it really looks pretty good. On the front, anyways. Once again, my bubble was burst with a sledgehammer. The backside to my surprise, had a ton of little ticks showing. UGGGHHH! The straight line work looked really good, but the filler is where it all fell apart. For some reason, the Glide thread needs the bobbin tension to be freakishly loose. As much as I hate it, I will probably rip it all out and restitch it, and not in the cranberry thread as I want. I will choose a thread that will blend with the quilt's backing, should the tension wobble again. Then there was the call from my son at 1:30. He (cough, cough) thought he was not feeling well, and needed to be picked up. Well, he's just fine, and I needed that extra hour to get myself unwound and productive again. I am frazzled right now. I have nearly 2 weeks this month that I won't get much quilting at all done, and this quilt is supposed to be done, blocked and bound for a show mid-July. The thoughts of pulling it out are seriously crossing my mind. I don't want it to come to that. After we got back home, I resolved that I have the ability to use shades of thread from white to cream to light gold, none of which need a highly contrasting bobbin. The back will still show the quilting, it just won't show the stitching in color. Downside: I cannot match colors to the front unless they fall into those shades. So, I quilted the gray background of one of these large star corners, using a Khaki (really looks like shiny gold) thread. I think it looks pretty good, though I now have to outline the blocks with this khaki thread to clean up where all the "bananas" meet the edges.